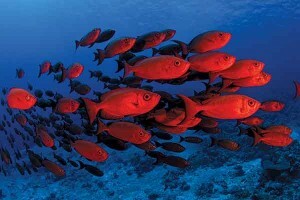 IMAGE: Parrotfish school over typical reef habitat in depths of 10─20m at the Houtman Abrolhos Islands. 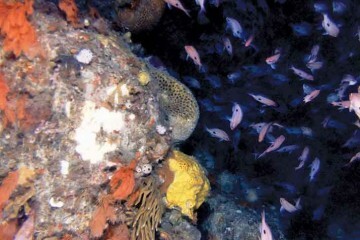 Image: Reef Life Survey. 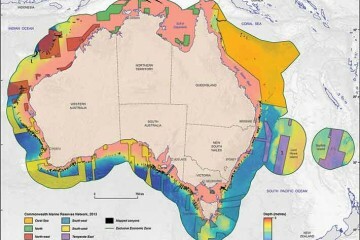 A suite of complementary, non-extractive survey methodologies is required to identify and monitor change in habitats and species across areas identified by the Australian Government as Key Ecological Features (KEFs) of the marine environment. 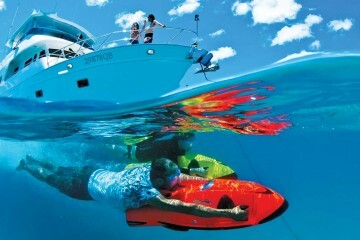 The Commonwealth marine environment surrounding the Houtman Abrolhos Islands is a KEF in the South-west Marine Region. 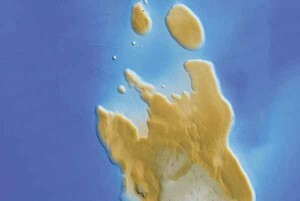 This complex of 122 islands and reefs, some 60 km off the mid-west coast of Western Australia, form the largest seabird breeding area in the eastern Indian Ocean. 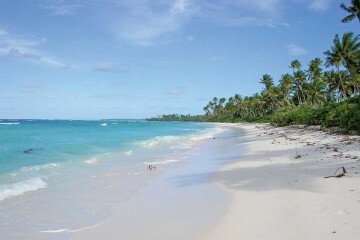 Many of the islands’ biodiversity features, most notably seabirds and rock lobster, are supported by benthic and pelagic ecosystems in surrounding Commonwealth waters. 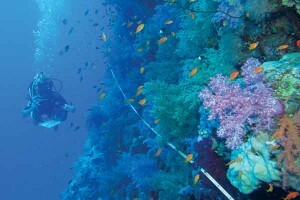 The shelf rocky reefs in the vicinity of the Houtman Abrolhos islands mark the northern border of kelp, and the southern border of coral, in Australia. 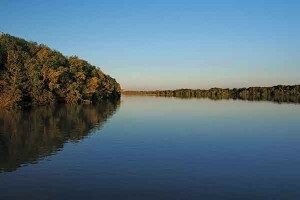 Because of this they are associated with very high biodiversity. Any changes in the distribution of kelp or corals in this region may signal climate-change induced shifts in species distribution. 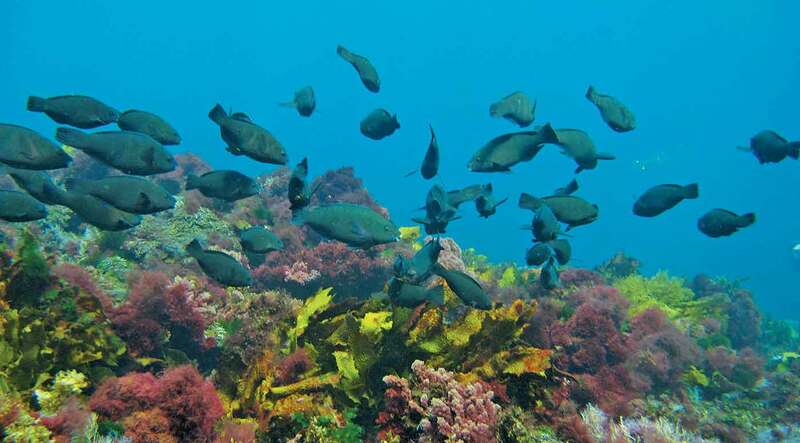 This project located shelf rocky reef coral-kelp communities that form part of this KEF, examined regional influences on gene flow between coral populations, and assessed isotope analysis of seabird feathers as a means of monitoring and evaluating changes in food webs. ABOVE: Amino acids extracted from feathers provide information on the bird’s trophic level, or position in the food chain, as well as the sources of nutrients important for primary productivity. Images: CSIRO. 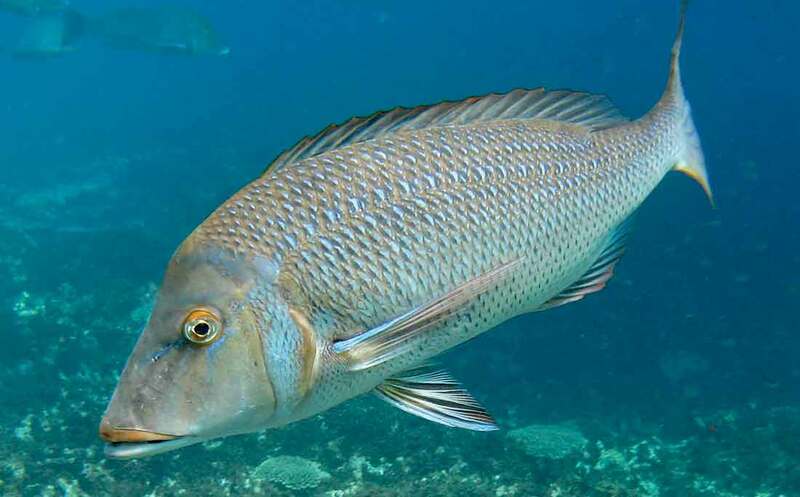 IMAGE: A Spangled Emperor (Lethrinus nebulosus) at 0─15 m depths. 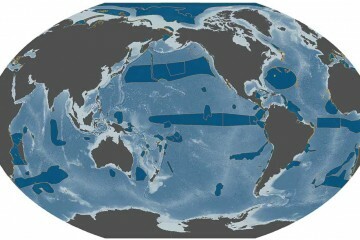 Image: IMAS/Reef Life Survey. 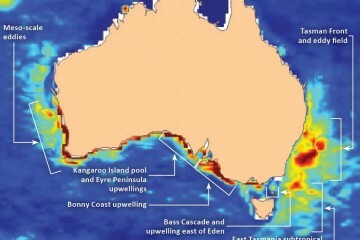 A survey designed using the Generalised Random Tessellation Stratified Technique (see story Applying spatially balanced survey designs to monitor indicators in Commonwealth marine reserves) identified the presence and patterns of benthic habitats in Commonwealth waters between the Houtman-Abrolhos Islands and the coast. Shelf rocky reefs (coral-kelp communities) in Commonwealth waters adjacent to the Houtman-Abrolhos Islands were located by a drop camera survey. Multi-beam sonar was used to delineate their boundaries. Integrated Marine Observing System autonomous underwater vehicles (AUVs) identified the presence/absence and abundance of coral, kelp and associated benthic communities. The proportion of coral genetic variation (a key component of resilience) attributable to ocean circulation was determined by linking genetic data from a panel of coral microsatellites (short repeated DNA sequences at a particular locus on a chromosome) to a three-dimensional model that simulated coral dispersal over time. A single tail feather (from each adult) and approximately 5–10 pin feathers (from each chick) were collected from two species of terns in a non-lethal and minimally-invasive way. Individual amino acids were extracted from the feathers and profiled using stable isotope analysis. Differences in the natural isotopic ratios for nitrogen (δ15N) and carbon (δ13C) were used to identify the bird’s position in the food chain, as well as the sources of nutrients important for primary productivity. 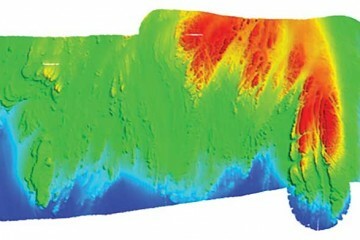 IMAGE: High resolution bathymetry of a shelf rock reef in Commonwealth waters adjacent to the Houtman Abrolhos Islands, derived from multibeam sonar swath. Image: CSIRO. Shelf rocky reefs were located in the Commonwealth waters of this KEF (these had previously only been identified in State waters, but were predicted to be an important habitat of this KEF). 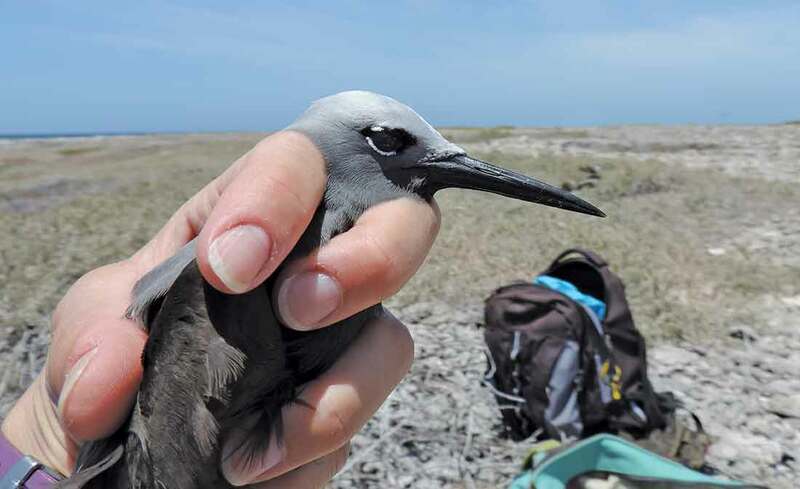 Stable isotope analysis enabled the feeding niches of sooty terns, bridled terns and crested terns to be differentiated for the first time. The results suggest that the absolute value of, and changes in, this nitrogen ratio may indicate the trophic level for several important seabird species, while the carbon ratio indicates the source of nutrients utilised by phytoplankton at the base of the food web. 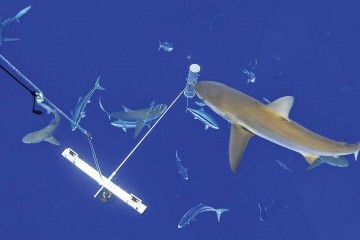 The technique may have potential for tracking fluctuations or trends in these variables over time providing a remote and cost-effective measure of the trophic status of offshore mid-water fish populations. Regional oceanographic circulation patterns are a better predictor of gene flow between coral populations at the Houtman Abrolhos Islands than the distance (as the crow flies) between them. Shelf rocky reefs, previously unknown, were located in the Commonwealth waters of this KEF, and the composition of coral-kelp communities will be characterised during the analysis of AUV imagery. Analysis of compound-specific stable nitrogen isotopes extracted from bird feathers was demonstrated as a possible cost-effective monitoring tool for offshore pelagic ecosystems which would enable the long-term monitoring of ecosystem health for this pelagic productivity KEF. The technique could be combined with new approaches to evaluating population-level plastics ingestion and identifying foraging habitats of seabirds.